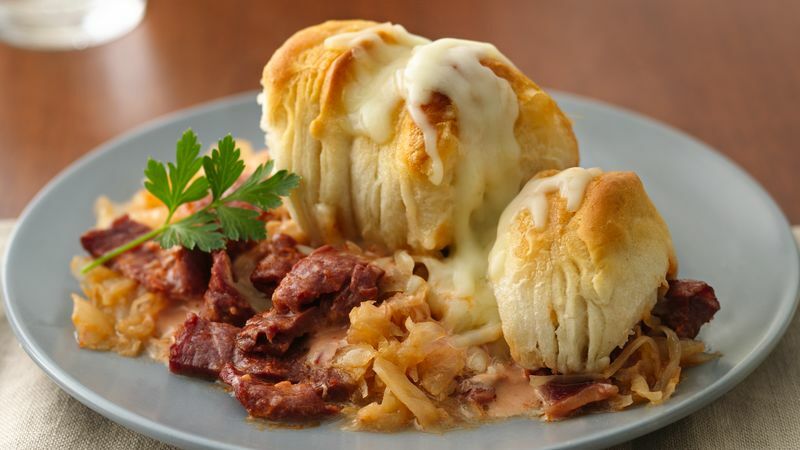 Spread sauerkraut evenly in bottom of casserole. In medium bowl, stir chili sauce and mayonnaise until blended. Add corned beef; toss until evenly coated. Spoon over sauerkraut. Cover; bake 30 minutes. Meanwhile, separate dough into 10 biscuits; cut each biscuit crosswise in half. Arrange biscuit pieces over partially baked casserole. Bake uncovered 18 to 20 minutes or until biscuits are golden brown. Sprinkle cheese over top. Bake 3 to 5 minutes longer or until cheese is melted. Pastrami can be used in place of the corned beef. Although this casserole bakes for almost an hour, the preparation is quick and simple.